Highly trained dogs are used by police forces throughout the world, for patrol duties and crowd control. They are trained to track and pursue suspects and taught how to arrest law breakers. Police and security dogs patrolling building sites and vital installations are generally more effective in the prevention of crime than sophisticated burglar alarms. Since the late 1960s, when a German Shepherd Dog and a Labrador were first successfully trained and employed as drug detectors, the Royal Air Force Police have undertaken the training of servicemen from other forces and countries in this specialized role. As terrorist activities throughout the world became an almost daily occurrence, successful trials established that dogs, and particular German Shepherd Dogs, could be reliable trained to detect explosives. Subsequent training was extended to include the detection of arms and ammunition. Today, Royal Air Force Police search dogs, as they are affectionately termed, are in service with the Royal Navy, the United States Navy and Air Force, and Her Majesty’s Customs and Excise, and search-dog handlers have been trained for many other countries. Any good working dog is potentially suitable for search work. Most commonly used are German Shepherds, Labradors, and other gundog breeds such as German Shorthaired Pointers, Irish Water Spaniels, Flat-coated and Golden Retrievers, and English Springer Spaniels. There is a popular but erroneous, theory that a drug dog becomes addicted to the drugs which it is trained to detect. Neither are ‘Bomb’ dogs are addicted to gelignite or TNT. The only addiction utilized in search dog training is the dog’s desire to retrieve. That desire provides both the incentive and the drive necessary to train the dog. Although the actual conditioning process is simple, great patience and understanding is required in building up concentration and agility in a potential search dog, which will have to adjust to many environments such as airports and aircraft, docklands and cargo ships, freight sheds which a multiplicity of cargo, private accommodation, and open fields and hedgerows. Dogs selected for intense and painstaking training in the search field must display certain qualities before they can be accepted. Although certain breeds lend themselves to such duties, success depends upon selection of individual dogs within the breeds. Any potential dog must have had a sound environmental education, which less emphasis on obedience training and more on developing a bold, friendly and well-adjusted animal. In order to fulfill the requirements for detection work, a dog must have moderate to low body sensitivity, responding to various voice tones. It must also possess strong hunting and retrieving instincts, combined with boldness, physical strength, and potential agility. Certain inherited characteristics make certain breeds ideal for search-dog training. 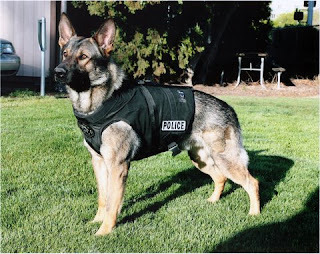 The German Shepherd Dog, for example, fits in every way the image of a police dog, having medium body sensitivity. It is a popular breed from which correct selection can be made, and it is highly respected to training. Retrieving is an acquired behavior pattern in the German Shepherd. The Labrador Retriever is another successful search dog which normally causes no apprehension to the public. It is highly developed olfactory instincts, moderate to low body sensitivity and a more independent nature than the German Shepherd. Retrieving is an instinctive behavior pattern, and the Labrador usually has well-developed hunting instinct. Individual characteristics of certain gundog breeds also have a bearing on selection for search-dog training. The hunting, for example, should display determination to search without a visual incentive, and while it may not retrieve, it should have the desire to pick up. Similarly the Retriever should distinguish itself by its determination to fetch, and though it may require a visual incentive it should be eager to carry and be possessive with prey. As in all aspects of dog training, the training of search dogs, irrespective of the selected scents they are required to search for, must be based on firm yet sympathetic understanding of the workings of the canine mind. The success of specialized training lies in the creating the correct incentive, harnessing the drive and channeling it to a useful end. Coupled with a sympathetic and thoughtful handler, the result is a highly effective team and ready and able to assist the various law enforcement agencies in their fight against crime. Dogs which are accepted for police search-training duties undergo a fifteen-week course. During training the team spirit is forged between the animals and their handlers, based on patience, determination, integrity and affection on both sides. The outstanding factor is patience. All search dogs undergo a routine veterinary inspection; from the age of seven years, when they are nearing the end of their working lives, they receive a thorough six-monthly inspection to ensure that they are still in good health and able to carry out their duties. At about eight years of age a search dog is retired, the handler usually buying the dog, which has just earned a quiet retirement. All dogs trained and used by the Royal Air Force Police have been donated by the public, many dogs coming from leading show kennels. It is indicative of the high standards at these kennels, specializing largely in producing show stock that first-class working dogs can emerge. High standards for potential canine recruits are set by the Royal Air Force Police. Each year the Service required some fifty trained dogs. To reach this figure two hundred dogs will be tested, approximately half that number will enter training, and of these less than half again will qualify. The recruited gift-dogs – German Shepherds and Gundogs – are all pedigrees aged between ten months and two and a half years. Potential gift dogs are examined by the expert inspectors in their own homes. Such inspection is the first hurdle in this unique recruiting program, which aims to keep the worldwide police-dog strength of the Royal Air Force at around 800. After a dog’s pedigree and age have been established, a strict acceptance test is carried out covering the animals build, movements and general health. Sadly, even the finest family pet can sometimes prove unacceptable when judged against the high standards required.